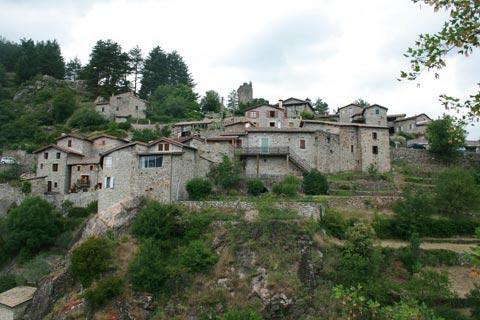 Jaujac is situated about 20 kilometres west of Aubenas, the last seven kilometres along a quiet and very attractive valley between ancient volcanic peaks. 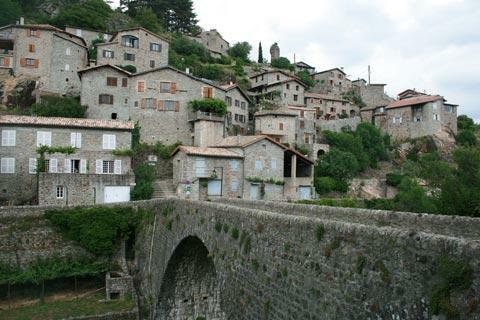 The village is classified as an Ardeche 'village of character' and within the Parc Regional des Monts d'Ardeche. Even as you approach the village you can see that it is in a very impressive location, with the Monts de l'Ardeche as a rocky backdrop to the medieval village below, surrounded by chestnut trees. 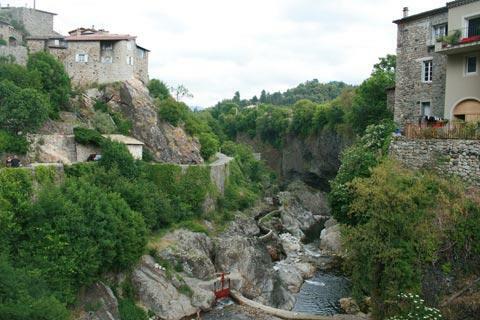 The village is divided in two parts by the river Lignon that flows through the middle of the village, the two parts being separated by a deep rock gorge and joined by an old stone bridge. To one side of the river the narrow tracks and alleys run up the hill between the ancient stone houses, while on the other side of the river there is an open square with shady plane trees and a couple of cafes, and some local commerces. Each side of the village has its own particular appeal and charm, so you need to explore both! Although the individual monuments are not necessarily very important, the ensemble of ancient stone houses, mountain backdrop and the river make the village very charming. 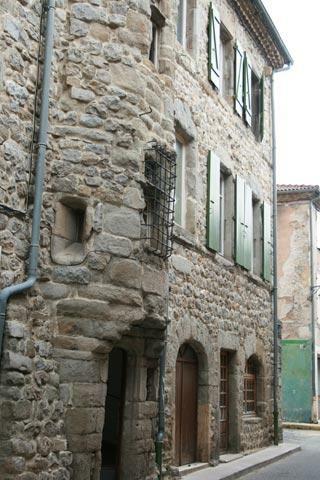 Jaujac also features three chateaux - the 12th century Chateau de Castrevieille (housing the village hall and some gites); the 14th century Chateau du Bruget; and the Chateau de Rochemure, now a centre for the Regional Natural Parc of the Monts de l'Ardeche. Along the river valley below Jaujac you can see unusual octagonal basalt columns caused when the volcanic lava that formed the landscape was cooling 11500 years ago. Close to the village and very popular with both children and adults is a tree-top adventure park, where you can follow a series of rope bridges, absails and swings through the upper parts of the trees. Bring a picnic and make a day of it! It is true that it doesn't take long to explore Jaujac unless you are off walking in the hills or exploring along the river valley, so you might like to combine your trip here with a visit to two other small villages nearby at Thueyts and Meyras.